The crux of the error suggests that the domain controller cannot be contacted, thus network level authentication cannot be performed. The error has been reported even when Network Level Authentication was enabled. Our strategy towards dealing with the issue would be to totally disable Network Level Authentication. While the NLA provides extra security, we perhaps have no choice here. 1] Press Win + R to open the Run window and type the command sysdm.cpl. Press Enter to open the System Properties window. 3] Click on Apply and then OK to save the settings. 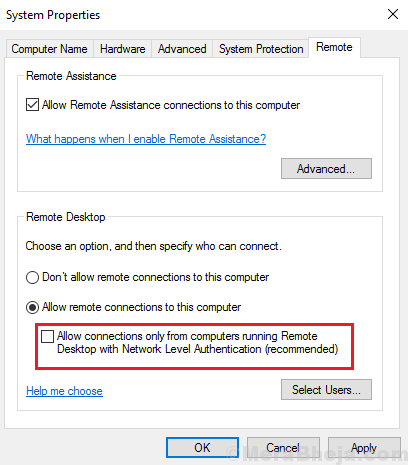 If the above method does not work, we can disable NLA from the Registry itself. 2] Select File and then Connect Network Registry. Wait till the network connects. 4] Change the values of the entries SecurityLayer and UserAuthentication to 0. 5] Close the Registry Editor. 1] Press Win + R to open the Run window and type the command PowerShell. Press Enter to open the Powershell window. Hit Enter and then enter command below. 3] Press Enter to execute the command and restart the system once done.